One of my first posts on this blog concerned a World War II booklet illustrated by Dr. Seuss. It was one of a cache of such booklets that had belonged to one of my uncles during his wartime service as a Navy pilot. Although not collector’s items, these little guides to China, India, Burma, West Africa, and even New Caledonia, fascinated me as a kid. As an adult, both before and after my discovery that the Dr. Seuss booklet was a collector’s item, I didn’t give them much thought. Several years ago, though, they were brought to mind by a call from the person who was then in charge of GPO’s public relations office. Every so often we get calls about long out of print Government publications, and this was one of them. A reporter was asking about A Short Guide to Iraq and did I have any information about it? “Well, yes. Oddly enough, I own a copy.” I explained the background and said I’d rummage around at home and find it. Within a few hours, I was in her office doing a telephone interview with a wire service reporter with a British accent. She seemed fascinated by how I had come to own a copy of the booklet she was seeking. As far as I know, the story never went anywhere, but I’m still amazed at how much excitement these old documents can stir up. As for A Short Guide to Iraq, what seems to engage people is that American troops were sent to Iraq during the Second World War and that so much of the advice it provides seems relevant even today. 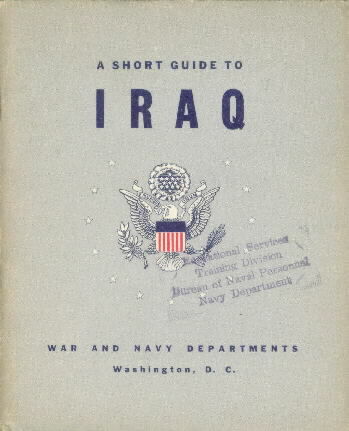 A university press has reprinted a facsimile under the title “Instructions for American Servicemen in Iraq during World War II” (the cover looks different but it’s basically the same book). It’s a quick read and very well done for its purpose, which was to give a quick overview of Iraq and its people for the average GI or sailor. It’s similar in intent, although less elaborate in execution, to the Afghanistan and Pakistan Smart Books I blogged about a couple of weeks ago. Click here to read this neat little booklet.